25.02.2017 Survey conducted by FYBSc. students from Senior Citizens preparation and presentation of their findings. Interaction with senior citizens on 8th September 2016 Seven students of T Y H D performed role play on the topic “portrayal of women on television” followed by a garba dance with the elderly at Balwantrai Mehta Panchayatiraj Jagruti Kendra, Shantivan, Wakadi, (Panvel). The women also sang traditional songs .This interaction was enjoyed by both the older generation and the students. 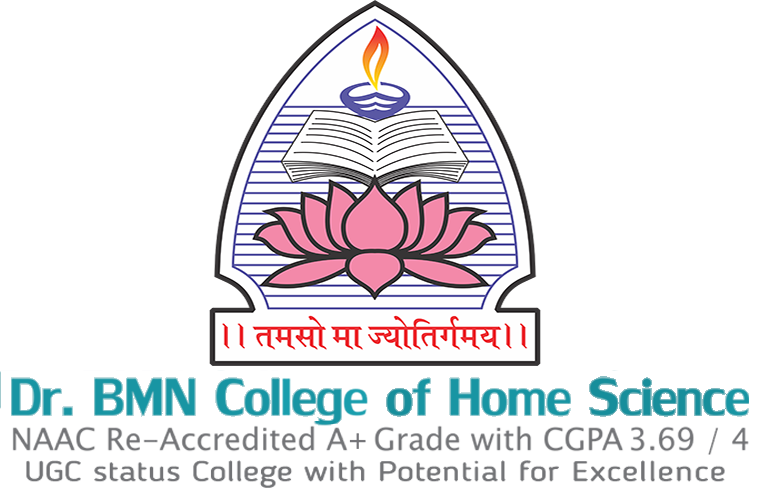 The department has a collaborative project with Dept. of Community Medicine (LTMMC hospital) for organizing cooking demonstrations and nutrition education programmes on a monthly basis. 28.07.2016 Nutrition education and demonstration of Malaysian Style Paratha by Ms. Neha Jalgaonkar , Ms. Swati Hotkar, Ms. Soni Lingala, Ms. Priya Sadawarte, Ms. Aditi Deshpande. 40 mothers of children under 5 years attended. 30.08.2016 Nutrition education and demonstration of Lifafa Paratha and Raita by Ms. Afsha Waghu, Ms. Mubasshira Sonde, Ms. Iram Fatima, Ms. Zehra Sayyed and Ms. Aaliya Sheikh.35 mothers attended a talk on PEM malnutrition. 29.09.2016 Multi nutrient rich Adai was demonstrated by Ms. Gauri Bhisale, Ms. Trupti Muluk, Ms. Hiteshree Torne, Ms. Jheel Vora, and Ms. Parveen Pathan. Mothers were educated on dangers of malnutrition. They explained on how to make the women aware about benefits of Santulit Aahar, what are various consequences they could face if they don’t follow a balanced diet and how nutrition and a balanced diet could help them recover from disease conditions. The session was very interactive. Third year students of Nutrition and Dietetic stream were taken to five different Aanganwadis in Ganeshnagar, Wadala East as a part of their Community Nutrition practicals. They were accompanied by Mrs Shilpa Waugh. First visit was arranged on 9th of February 2017 where the students were first introduced to the aanganwadi worker Mrs. Manisha Gaikwad. Mrs. Manisha was conducting a non formal education class for the children in the age group of 3-6years. Also, the children were given small meals which included lapsi as a part of the mid day meal programme. 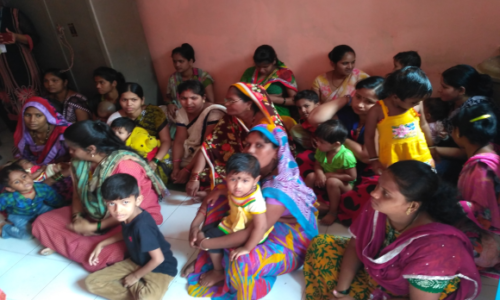 Thus the students were acquainted with the working of the aanganwadi centre during the first visit and the schedule for data collection, selection of the target groups and Nutrition Health Education (NHE) for various target groups was fixed up with the help of Mukhasevikas. 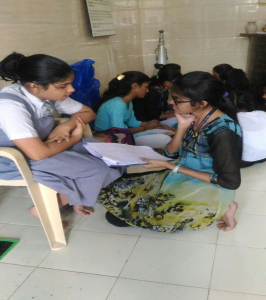 Their head Mrs. Savita Hulsulkar helped the students by guiding them on how to approach different aanganwadis and coordinate with the aanganwadi workers. The entire class of the third year (ND) students was divided into five groups consisting of five girls in each. They were asked to choose a target group from the community and a Nutrition Health Education programme was planned, prepared and delivered to the target groups on 2th and 3thof March 2017. 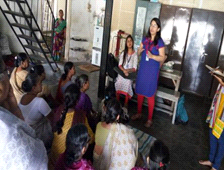 Mrs Sugandha Lad and Mrs Pradnya Ambre organized and conducted a training program in collaboration with the Dept of Fiber and Textile Processing Technology, Institute of Chemical Technology, Mumbai for marginalized section of the society from Chembur centre of Stree Mukti Sanghatana. Skill training was on fabric painting, embroidery basic stitches and also the application of it on the garments and articles to increase the value of the product.